Last week’s UTT article entitled “Unfit for Duty” makes the point that two of the men professionally responsible to the President of the United States for speaking truthfully about national security threats – LtGen HR McMaster and Sebastian Gorka – are not doing so, specifically as it relates to the Islamic threat. In response to the article, UTT received numerous communications from individuals, groups, and the media. Many of the comments came from people with a clear understanding of the threat to the United States from the Global Islamic Movement, and the article was referenced and republished in several places including here and here. Some, however, are still having a hard time understanding the true nature of the threat from Islam. Many are simply not capable of believing such a grave threat exists in such a real and immediate way. Some people are still ignorant about what Islam actually teaches because they have been subject to years of Islamic leaders and elected officials in the West telling them Islam is not part of the problem, but is part of the solution. See the UTT video on this HERE. Many media outlets appear disinterested in the truth. Despite the fact Islam – at the doctrinal level at Al-Azhar University in Egypt to Islamic elementary schools – teaches jihad is an obligation until the world is under Islamic rule, the media continues to gobble up whatever the Muslim Brotherhood/Hamas leaders tell them and dutifully regurgitate it. So when organizations like UTT speak factually about Islam and what Muslims are taught at Islamic schools across the globe, the media stands with terrorists and anti-American terrorist supporters like the Souther Poverty Law Center (SPLC), and levels personal attacks without ever discussing the facts of the matter. This is because they cannot win the argument on the facts. 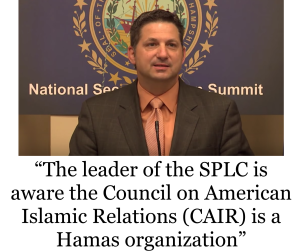 SPLC’s President Richard Cohen must remember he sat next to UTT’s Vice President Chris Gaubatz in the summer of 2016 while Mr. Gaubatz – who went undercover at CAIR for six months and retrieved over 12,000 documents from their headquarters revealing Hamas (doing business as CAIR) is involved in fraud, sedition, terrorism, and other offenses – testified before Senator Cruz’s hearing. Mr. Cohen cannot honestly say he is not aware CAIR is a Hamas/Muslim Brotherhood entity. We do have photographic and video evidence Mr. Cohen was seated approximately 18 inches away from Mr. Gaubatz as he testified. 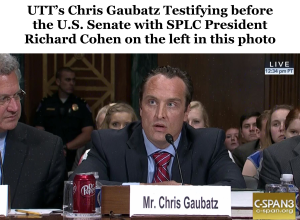 See the coverage of UTT’s rebuttal of SPLC’s attempt to slander UTT and its founder John Guandolo here and Chris Gaubatz’s testimony in front of a U.S. Senate hearing detailing the Muslim Brotherhood/Islamic threat while seated next to SPLC President Richard Cohen here. A day is fast coming where attorneys and leaders at SPLC, as well as members of the media, will have to account for their direct and material support for terrorist groups, especially since it is a violation of federal law. So what is it UTT teaches that causes such spasms among hard-left marxists and jihadists? Its called “The Truth.” Here is a small taste of it. The question is not “Why would they teach this in Islamic schools in America?” The question is “Why wouldn’t they teach this?” It is what Islam is. Why are Anwar al Awlaki’s CDs and books sold in mosque bookstores across America? Why was Omar Abdel Rahman (the “Blind Sheikh”) a revered Islamic scholar around the world? Why did a prominent scholar and teacher at Al Azhar, Abdullah Azzam, join Osama bin Laden to create Al Qaeda? These men were teaching and acting on authentic and authoritative Islamic doctrine. It is a capital crime in Islam for a Muslim to teach another Muslim something about Islam that is not true, and it is obligatory for Muslims to lie to non-Muslims when the goal is obligatory (Reliance, r8.0) – like in jihad. So, for national security strategists, intelligence professionals, media people, elected officials, university presidents, and others – if you want to learn about Islam, and your path to learning includes talking to the local Imam or your friend who is a Muslim, that is unprofessional. Read books written for Muslim audiences by Islamic authorities and you will always get the “version” of Islam ISIS and Al Qaeda teach and propagate. There is one Islam and one Sharia. Come take a class with UTT and learn the truth. Joe Friday was the name of a TV detective-sergeant with the Los Angeles Police Department (LAPD) who admonished each of the complainants he and his partner interviewed to simply give them the facts –“just the facts, please, just give us the facts”. The show was called “Dragnet”. Thus, Wahhabis, Sunnis, Shias, et al – are religious distinctions among the quintet of mandates referred to as “Islam”, and in view of the 1st Amendment none of those matter. I.e. whether or not an individual is SHARIA-ADHERENT is all that actually does (since it exclusively pertains to their law); “just the facts, please, just give us the facts”; your religion is none of our business. KEEP IT SIMPLE! Bush-43s response to 9/11 — to obstruct justice in order to have the country believe that Islam “is a religion of peace” was the act of a sociopath with no sense of moral obligation whatsoever who consciously chose to put dynastic profits ahead of patriotism rather than order an immediate retaliation. Thus millions of contextual deniers are those who continue to believe what the president said. Notwithstanding that “Peace” to a Muslim (as UTT teaches) is defined as the period following total global submission to Islam. See: “Bush-Saudi Connection” by Michele Mairesse; and “Bush & Saudi Photo Collection”.